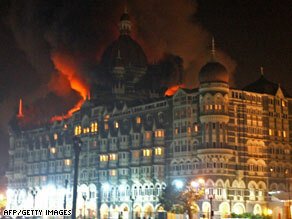 (CNN) -- Indian authorities in Mumbai were battling fires at two luxury hotels on Thursday night , more than 20 hours after a series of terror attacks that killed more than 100 people. "I had come from the U.S. last night and was sleeping in my room at the ninth floor when at 10:30 p.m., I suddenly heard noises in the lobby. People were running in panic. When I inquired, one of the hotel occupants told me that some terrorists have entered the place and are threatening the people," said a person name Punya, who was staying at the Taj Mahal Hotel. At 11 p.m., a hotel worker told Punya to to lock up his room and windows. "I started receiving calls and SMSs from friends and family members who were worried about my safety. They informed me about the gravity of the situation. It was scary," Punya said. Punya was holed up in the hotel for 15 hours before he was able to escape at 1:30 p.m. local time. "When I was coming out, I saw a lot of blood stains on the floor," Punya said. "I inquired about it and came to know that a couple of hotel staff were killed."